Because of rain, flooding and landslides, June, July and August are generally an off months for tourists in Nepal.but August half start trekking session in Nepal, still ended of November I am sure this year 2017 full off tourist around the Annapurna , Langtang , masaslu, Upper Mustang, Upper Dolpa , Kanchenjunga, Chitwan , Lumbini , Kathmandu , nagarkot ,Around Kathmandu/Pokhara and upper Annapurna like Manang/Down Mustang are probably the better destinations for short treks in the monsoon months of June, July and August in Nepal. 2017 is a Manang Trekking celebration year and the area is full of festivities. Monsoon pretty much ensures a tourist free time and is a good chance to see the area off season and quite. We can offer this as a Set Trip on June, July August, September, October and November . Day 1:7 hours driving by local bus, you will reach Besisahar (760m. ), a popular Gurung town. Day 2: Walking along the bank of Marshyangdi River for 3 hours, stop for lunch at Bulbule and 1.5 hours walking to Ngadi (920m.) and to Bahundanda (1,400m.) where we camp for the night. Day 3:To Ghermuphant (Big plain rice field, 1,050 m.). Slightly climbing up and overnight stay at Jagat. Day 4:Along the way, beautiful springs and cliffs are found. Lunch camp will be in Tal (1,680m.) a spot that offers beautiful landscapes. Mani walls and a wide valley welcome us to Manang district. Stop for the night at Dharapani. Day 5:Tilche, Thonche, Tache and Nache (Old Manangies villages) can be viewed from the trail. Camp at Chame crossing through Bagarchhap. Day 6:Great view of Mount Manaslu (8,463m.). We climb up 300 m. though mountain forests where snow leopards sometimes visit. 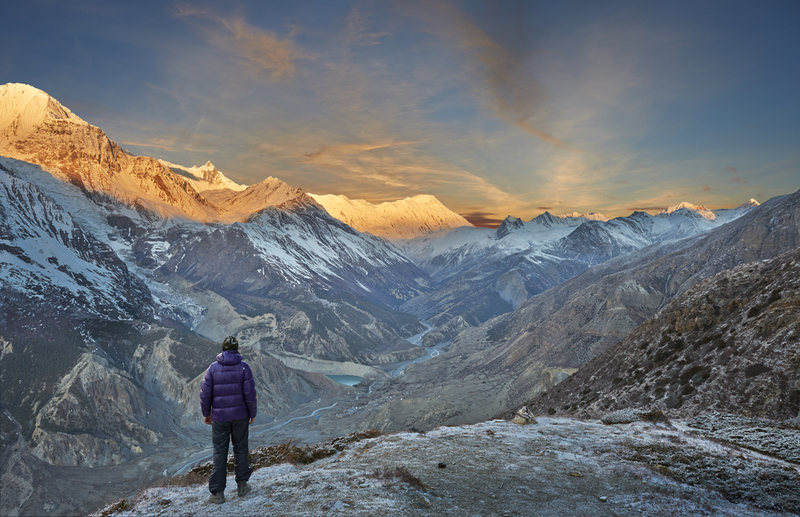 Views of Annapurna II, Annapurna IV, Pisang Peak and Chulu Far East. Night camp at Hungde (3,280m.). Day 7:Visit Braga Monastery (500 years old), Pocho monastery (1000 years old), view Milarepa cave, lots of beautiful shaped cliffs and Mani walls. Night at Manang (3,440m.). Day 8:Rest day, visit Gangapurna lake/glacier, many monasteries, and an altitude sickness class offered by Himalayan Rescue Center. Day 10:Long day. Early morning trekking start since strong winds is blow from 9:00 AM on the top. 700 m. up and 1700 m. down to Muktinath. From the top, panoramic view of almost all mountains of the region. Visit sacred Hindu temple at Muktinath with 108 taps and an amazing flame, nunnery monastery etc. Day 12:Flying to Pokahra and drive to Kathmandu. No Minimum number of people. Bar & beverage bills,tea/coffee nature of personal expenses, bottled water, desserts, heater,shower, insurance, personal cloths, tips to the staff, and service not mention. We accept the major cards such as Mastercard & Visa or through direct bank transfer. Please be informed that we have to charge you 3.5% on top for Card Payment. We accept Nepalese rupees, CASH USD, Euros, UK Pounds and Travelers Cheques as well with no surcharge.